“Anything special about your horse?” Gadur Yir asked, bored out of his skull. “A stolen horse, you say? Does this happen often in this place?” The question came from a newcomer, a plain-looking man in nondescript grey clothing. The conversation about the horse also seemed to draw the attention of the lean, melancholy elf who had been playing his harp in the corner. Gadur Yir noted a long spear and a tall shield with the image of a crying maiden. They sat down to talk some more through the evening, and soon, they all agreed to continue to Baklin together the next day. At sunrise, the newly formed company – Gadur Yir, Drolhaf Haffnarskørung, Phil the Terror of Turkeys, Lafadriel Hundertwasser and the taciturn Armand the Scumbag – left Haghill through the front gate, just as a row of tired soldiers were returning from the siege of the Singing Caverns. They were leading a row of chained orcs, some of them clearly from Truglag’s Tavern; they were also carrying two cartloads of ale barrels and assorted goods. None of the green-clad men were with them. “I suggest we should make a small detour. Bramerlic the Mineral Dealer is still missing, and the soldiers might not have found him at Truglag’s” Phil recommended. They crossed the blooming fields, carefully avoiding the beekeeper’s hut, and descended into the caverns. A short expedition showed that Tuglag’s had been well and truly ransacked: the guardian lynx was slain, and the furniture was all smashed up. There was nothing of value, although the passage behind the counter lead to a few more rooms and a secret escape route into the wilderness. If Bramerlic had ever been held there, he was no longer present. Back on the road, the company travelled west. After a few hours, they passed the remains of a primitive village – rotund stone huts conquered by the wilderness, long abandoned. Finding only the tracks of boars, and not interested in a confrontation, they decided to continue rather than investigate. Perhaps an hour from the village, the road crossed a small river. They scrambled for the undergrowth and hid themselves as well as they could as two great lizard monsters with enormous wings and long, swan-like necks descended on the ford. They hissed and drank in large gulps. They remained silent as the grave as the beasts drank themselves full, and took to the air again. “These two were sent by Haldor himself, and you let them get away!” Phil teased the half-orc. “I am a little disappointed” nodded Armand. "I wonder if the wyverns are connected to the abandoned manor of the Feranolts on that deserted island. Could they have killed the inhabitants there?" muttered Gadur Yir, mostly to himself. However, things didn’t stay quiet for too long. Cries came from the north, beyond the pine trees, and strange, rasping roars responded to it. The wyverns had met someone in the woods, and judging from the clamour of weapons, they had met their match. “After me!” Gadur Yir cried, swiftly crossing the pine forest. But by the time they arrived, silence had fallen on the large clearing where the woods gave way to leafy plants, and they beheld a scene of horror. The wyverns, slightly bloodied, were feasting on the grisly remains of a group of Northmen. The only sounds were the snapping of bones and the tearing of meat as the beasts gorged themselves. “In the name of Haldor, perish, you wyrms!” hollered Gadur Yir as he charged the more wounded of the pair, the others following a bit more cautiously. The half-orc rained blow after blow on the beasts, but he was struck by one of the deadly stingers, and went pale from the shock. “Githoniel Elbereth, Silendil Mithrill!” came Lafadriel’s battle cry as he came to his aid, while those who stayed back, rained arrows and crossbow bolts on the beasts. At last, the two reptilian horrors were brought down, and they exhaled their evil spirits. “Let us rest a little, because I feel very, very bad…” whispered Gadur Yir as he staggered to the nearest tree, and fell with his back to the thick trunk. Lafadriel looked far westwards, sighed, and took out his shovel from his backpack. The others collected the Northmen’s loot: 25 platinum coins – a rare and valuable haul – a potion, and an old brass sceptre that Phil appraised for 80 gold pieces, three intact chain shirts (the rest were too chewed up or punctured to be useful), and a rune-engraved longbow named “Kingfisher”. Armand cut up the beasts to check if they had something in their gullets but found nothing, while Phil had carved off some of the scaly skin. They dug shallow graves to bury the dead while Gadur Yir was fighting for his life, hanging between this world and the next. He felt his consciousness fade and his vision dim; but before the spark of life would leave him for good, he felt the touch of a hand over his heart, and the venom of the beasts being drawn from his blood. Haldor had performed a miracle for his champion! With that, he drifted into a peaceful, dark sleep. Gadur Yir’s body was too heavy to carry over the shoulder, and he was delirious, hovering between life and death. Drolhaf Haffnarskørung and Armand the Scumbag assembled a stretcher from two pieces of wood and a length of rope. They also searched the half-orc with Phil’s help, but found nothing suspicious in his pockets. Finally, they returned to the road. Beyond the ford, the road entered deep and dark woods, filled with birdsong. They were passing through a ravine between two tree-capped hills, when they heard the merry sounds of a pipe. The source of the unlikely music was a short, jovial-looking man in weathered green clothes and a feathered cap, sitting on a fallen tree by a yawning cave entrance and playing a cheerful ditty. Next to him slept a snoring mound of flesh and feathers – something that looked like a cross between an owl and a bear. The man smiled and nodded. Drolhaf’s eyes narrowed, but he nodded solemnly. The Piper played a little trill, then smiled like a cat. Phil the Terror of Turkeys and Armand the Scumbag gasped and quickly traded a glance, but Drolhaf gestured to them to stop, and counted out the money. Drolhaf quickly nodded, said his farewell, and they left the ravine, followed by the pipe’s merry tunes. His words were followed by an uncomfortable silence, but nobody cared to turn back and ask. Gradually, the forests thinned and they came to a fork in the road. 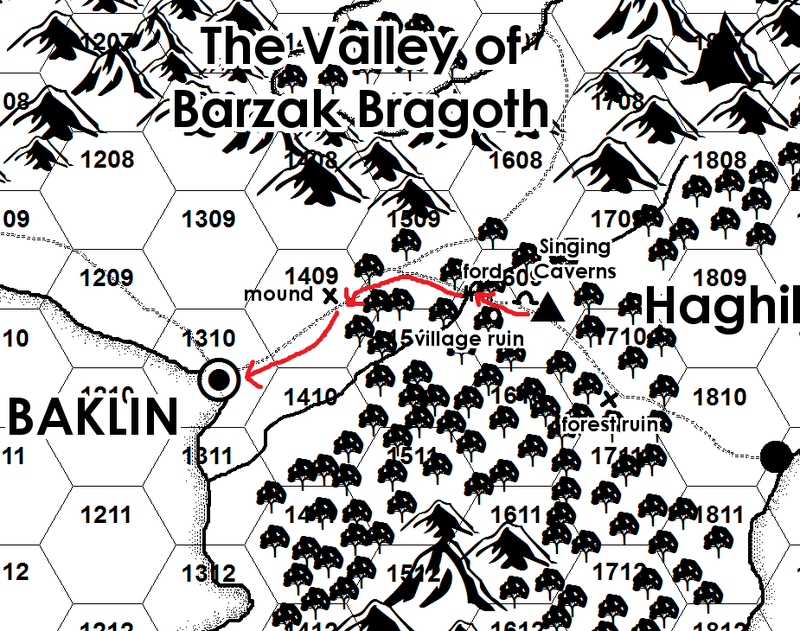 An old, but fairly well-maintained signpost pointed back east towards Haghill, southwest towards Baklin, and northwest towards Barzak Bragoth and Granite Bastion. Drolhaf looked at the pale, unconscious body of the half-orc. 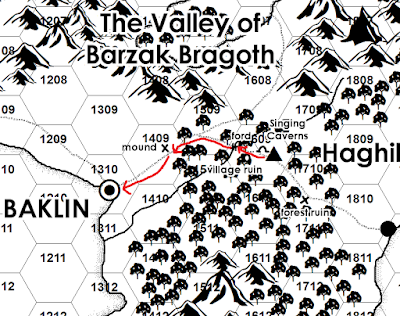 They turned towards Baklin, and were at last out of the woods as dusk approached. Rolling hills and fields of grass stretched to the distance, broken here and there by tall mounds. When they could no longer go on, they made camp next to one of these outcroppings, covered with hardy scrubs, and crowned by tumbled white standing stones. On Phil’s advice, they avoided it, and instead, made camp in a small depression where they would be hard to see. The hobbit’s instincts were correct: on the first watch, Armand saw a row of lights creep towards the mound. He crept up to Drolhaf, and shook him: “Hey, Soap-man! Something’s afoot!” They watched for a while, but could not make out who was carrying the torches. Waking Lafadriel Hundertwasser, the elf finally saw them for a company of goblins, perhaps thirty men strong. They were climbing up the steep incline in an orderly row, and the wind carried guttural shrieks and rhythmical chanting. They lifted Gadur Yir, and silently left camp, spending the night at a distance. When dawn broke, they returned to the scene, only to find the goblins gone. Lafadriel climbed up to the top, but only the tracks of sandaled feet remained, along with the remains of a bonfire, broken and charred bones, and two antique bronze daggers. Looking around, he could see a mound further north. They continued along the road, travelling south through the heath, which was filled with vicious snakes they could scarcely avoid. Shortly after noon, the highland began to descend towards the sea, and they could see the white walls of Baklin surrounding a narrow bay. The city walls were built on an escarpment, with the massive palace complex on the northern side; below them were rows after rows of houses until they reached the harbour. 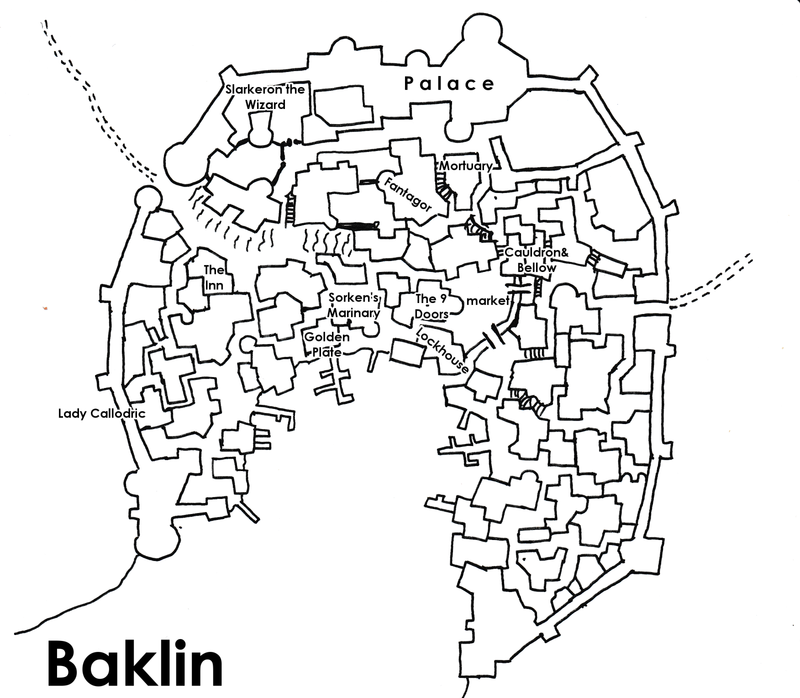 At the gates, they paid one gold per person to enter, and Drolhaf paid five more for a simple city map. 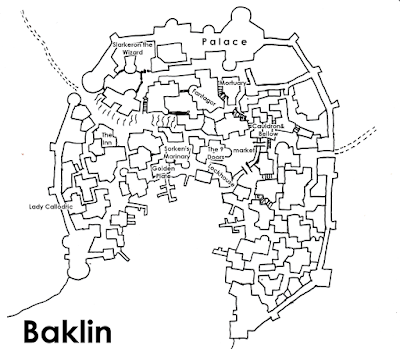 “Would you recommend a place to stay while in Baklin?” he asked from one of the guards. “I will do” said the barbarian as he handed another gold piece in the man’s hand. They made their way down to the city, through the narrow plazas and markets. The Lockhouse was a tall, ominous building overlooking the waterfront, full of pulleys and platforms. Guards and accountants were running to and fro on various errands. The platform they were looking for stood next to the Lockhouse, a scaffold with a pile of leather sacks and multiple long, hafted iron maces chained to a central stone pillar. Drolhaf beckoned to a loitering fellow. “They aren’t too keen on trials around here, are they” mused Phil. The sailor guided them to a small shop on the side of the marketplace. The Cauldron & Anvil was busy with the coming and going of several apprentices, working on different metal objects under the hands of their master, Ragorlak Othmar. Othmar wore a mask covering half his face, and when Phil asked about his best wares, he showed them the ingots of dragon iron he was working with, as well as a row of breastplates hammered from Arxine cobalt-steel. Lady Callodric maintained her household in an elegant house next to the western wall. The antique residence had belonged to the Count of Tullomarg, who was back in the Twelve Kingdoms on account of one of the many power struggles that had divided the place into a myriad mutually hostile territories. The Lady’s household included her own guard, servants, and Harkell the Butler, who received the good news of the enchanted flower’s arrival with the same world-weary contempt as anything else. He led the company to a cool little side garden to wait for the lady, and ordered a maid to bring refreshments while he conferred with her mistress. The Lady was in her early fourties, an elegant sight in her velvets and silks, mixing the fur-lined cloak and hunting boots typical of the Twelve Kingdoms with the more refined Kassadian aesthetic. She nodded courteously as she entered the garden. “Indeed we do, my lady!” Drolhaf bowed and beckoned to Phil, who produced the enchanted flower, still intact and glowing with an inner light. (Session date 20 May 2017). Referee’s notes: The first fully successful instance of divine intervention in the campaign: Gadur Yir was almost a goner, but was saved at the last moment by Haldor’s protective hand. He is still in a rough shape, and needs healing to recover properly, but the longest-lived character of the Inheritance campaign is still kicking.